27. 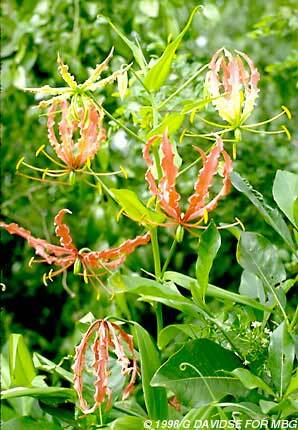 Gloriosa Linnaeus, Sp. Pl. 1: 305. 1753. Herbs perennial, with a stout, tuberous rhizome. Stem sometimes branched, usually elongate and scandent. Leaves cauline, alternate, opposite, or whorled, subsessile, apex bearing a tendril. Flowers few, long pedicellate, sometimes in a corymb, large, showy. Tepals 6, free, spreading or reflexed, persistent. Stamens 6, inserted at base of tepals; filaments filiform; anthers versatile. Ovary 3-loculed; ovules many per locule. Style long, filiform, apically 3-lobed, adaxially stigmatic. Fruit a capsule. Seeds subglobose; testa bright red, spongy. About five species: S and tropical Africa, tropical Asia; one species in China.